The "Everything" Peckish pack is just one of the brand's five flavors. Hard-boiled eggs are kind of the original grab-and-go healthy snack (that wasn’t fruit). For generations, families would have hard-boiled eggs sitting in their fridge for easy and satisfying snacking. Fortunately, outsourcing this process is possible. Peckish sells organic, free-range and certified-humane hard-boiled eggs in millennial-friendly packaging. 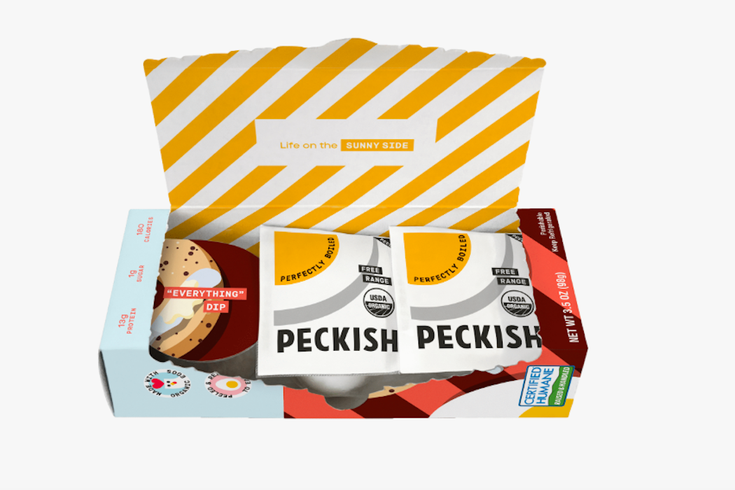 Inside each of their Peck Packs, along with two individually wrapped eggs, comes a container of sprinkles in one of five flavors: Everything (yep, like the bagel), Fried Rice, Rancheros, Salt & Pepitas, and Maple Waffles. You just dunk your egg, bite, and repeat. Plus, each package will provide you between 11 and 14 grams of protein that require little, to no, effort to consume. The toppings are free of gluten and refined sugar, plus paleo, keto and Whole30, too. They’re made from things like organic quinoa crispies, roasted pepitas and dehydrated veggies. And the only sweeteners you’ll ever see are coconut sugar and maple syrup. Aside from a quick snack, Peckish eggs and toppings are also easily incorporated into (sprinkled on) meals, Bon Appetite reports. While the options are limitless, Peckish power moves include adding the Fried Rice eggs to a quick ramen, the Everything flavor into a sandwich or Rancheros on avocado toast. Peckish eggs are not currently sold in Pennsylvania, but you can order them online here and have them delivered right to you.